Today it is recommended that all patients with the suspicion of bladder, either because of an episode of hematuria or a previous bladder papilloma, be examined endoscopically. Conventional cystoscopy remains the mainstay for diagnosis, management and follow-up of urothelial tumors, and repeated surveillance cystoscopy examinations are requisites to assess disease control. Particularly in man, this clinical cystoscopy has its own drawbacks, including patient discomfort and relatively high cost. Generally, conventional cystoscopy is planned under general anesthesia, with antibiotic therapy and an overnight hospital stay. 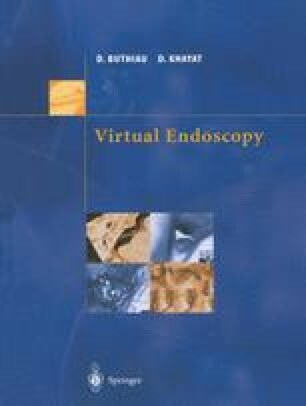 In order to avoid these requirements, a less invasive and costly method may be represented by virtual endoscopy or 3D CT endoscopy. 3D CT endoscopy is a new term used to describe computersimulated endoscopy procedures derived from thin section-CT of gas-filled or contrast enhanced hollow viscus of the human body, and has been widely applied to the paranasal sinuses, the upper respiratory tract, the tracheobronchial tree, the gastric and the colonic tubes, the vascular structures and more recently to the urinary tract and especially the bladder, in which carcinoma must be conceived as a focal expression of epithelial abnormalities that may be quite diffuse.